A relatively modern breed, the Boykin Spaniel breed is highly regarded for their hunting abilities of water fowl. Originating in the Southern United States, the Boykin Spaniel is designated as the official dog of South Carolina. The Boykin Spaniel is sturdy, of medium size, and well-built. This breed possesses agility, speed, and endurance. Boykin Spaniel's are capable of covering any type of terrain in any weather, and are excellent swimmers. They are skilled both in field and water retrieving. The Boykin Spaniel is amicable, loyal, devoted, and docile. The Boykin Spaniel is an enthusiastic hunter, pleasant companion, and willing worker. They thrive on human contact and get along exceptionally well with children and other pets. The Boykin Spaniel requires regular brushing to prevent matting. Bathing should be done when necessary. It is important to regularly check the ears for debris or infection. 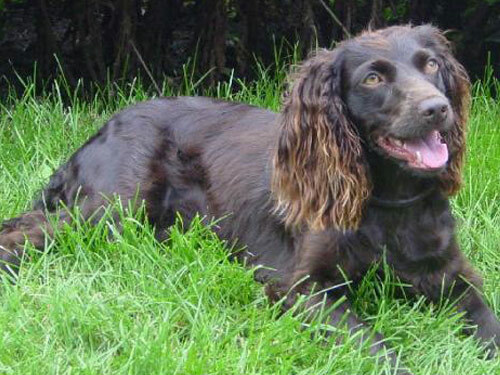 The Boykin Spaniel breed is prone to such health issues as eye problems, hip dysplasia, skin and heart problems. The Boykin Spaniel coat is of short to medium length, is straight to moderately wavy, and fine in texture. There is light feathering on the ears, legs, feet, chest, and underside. Boykin Spaniel's excel in structured agility and obedience classes. The Boykin Spaniel possesses a softer temperament than other Spaniel breeds so does not respond to harsh or heavy-handed methods. They do quite well with motivational training. They require fairness and consistency. The Boykin Spaniel is not recommended for apartment living. They require daily exercise and mental stimulation or they will become bored and destructive. This breed is exceedingly driven and energetic and do best in a rural setting. They thrive on hunting, swimming, and family activity.